Suzie's Gift and Tea Shop07821 698316work Tea/Coffee ShopSuzie's Gift and Tea Shop is a beautiful 16th Century vintage tea shop, hosting a wealth of historic character and charm. Within our charming tea shop we also have a hand-made gift shop, specialising in the most exquisitely unique bespoke creations, gifts and home ware. Our menu is filled with delicious home-made delights such as soups, quiches, sandwiches and jacket potatoes. To compliment our menu we have an ever-changing Specials Board offering hot meals and naughty puddings! We also have a range of luxury drinks such as Creme Brulee hot chocolate, unusual teas and loaded milkshakes! Our tea shop helps to promote friendship and caring by hosting the Kindness in a Cup Friendship Group once a month, we also are an ambassador of the FaNs Network Wishing Washing Line. We work along side several local residential care homes, where we peg their wishes onto our in-house Wishing Washing Line, ready for our customers to read and choose a wish they can help make come true. Our warm, welcoming and friendly atmosphere creates a harmonious, relaxing experience for our customers, who enjoy our vintage music and the ambience of being in such a quaint, historic building. 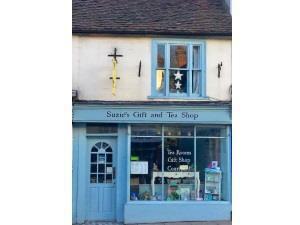 Suzie's Gift and Tea Shop is a beautiful 16th Century vintage tea shop, hosting a wealth of historic character and charm. Within our charming tea shop we also have a hand-made gift shop, specialising in the most exquisitely unique bespoke creations, gifts and home ware. Our menu is filled with delicious home-made delights such as soups, quiches, sandwiches and jacket potatoes. To compliment our menu we have an ever-changing Specials Board offering hot meals and naughty puddings! Open Tuesday to Saturday, 10am-4pm.